Ohio Vote Scandal: The County where Buckeyes sold their votes to the highest bidder. You Want My Support? How Much Are You Offering? One Ohio county’s long, sordid history of selling its votes to the highest bidder. Records of the Redpath Chautauqua Bureau, University of Iowa Libraries, Iowa City, Iowa. Defenders of democracy and proponents of free, fair elections have plenty to fret about in Ohio—the possibility of voting machine conspiracies, the impact of unrelenting super PAC-funded advertising, and cable-company partisanship, among other things. It’s serious stuff, perhaps even serious enough to affect the outcome of the 2012 presidential election. But Ohio’s modern-era electoral gamesmanship has nothing on the Buckeye State’s voting shenanigans of yesteryear. Unless the residents of Cuyahoga County have engaged in secret compacts to trade their votes for iPad minis, or Franklin County voters agree to cast their ballots for the candidate most willing to secure them tickets for the big Michigan game at the Horseshoe on Nov. 24, the century-old violations of Adams County will continue to set the bar when it comes to election fixing in Ohio. Modern-day Adams County, which borders Kentucky and is located less than 70 miles southeast of Cincinnati, is a favorite of outdoorsmen, who flock to Ohio Brush Creek for some of the area’s best smallmouth bass fishing. Crafters, meanwhile, tend to visit the area to partake in the quilt barn auto tour. But in the early 1900s, this sleepy rural region found itself in the midst of a full-fledged crisis. Adams County, around the onset of the 20th century, was one of the nation’s foremost hotbeds of vote boodling—the practice of buying and selling votes for political office. The story of just how bad things got in Adams County, and of how one man, Judge A.Z. Blair, endeavored to set things right, have largely been lost to history but are discomfortingly pertinent to our own electoral moment, even if it’s less common to buy and sell votes quite so boldly nowadays. According to a 1911 article in McClure’s Magazine written by Judge Blair, elections in Adams County were virtually boodler-free prior to the Civil War—largely because nearly everyone who lived there voted along the Democratic Party line. But when soldiers returned home after fighting on the Union side, hundreds of them had become loyal to the Republican Party, and Blair noted that by 1867, when Republican Rutherford B. Hayes ran for governor of Ohio, the practice of vote buying had begun to infiltrate the county. For the next decade or so, the purchasing of votes was at least somewhat discreet—with candidates and party loyalists providing willing vote sellers, mostly poor farm workers and others of modest means, a dollar or two for each vote. Gradually, both political parties became more aggressive in their vote-buying efforts, much to the delight of county residents. In 1879, according to a 1911 edition of Cosmopolitan Magazine (not the same publication we’ve come to know as Cosmo), a Republican candidate for governor “sent two-dollar bills into Adams County” to fund vote-buying operations. Not to be outdone, Democratic partisans from the nation’s capital journeyed to Adams County in 1886 with “stacks of ten-dollar gold pieces” in an attempt to secure the county for their party. No longer was it just poor farmhands exchanging their votes for cash. “Thirty thousand dollars was spent to carry Adams County Democratic that year,” according to the Times Sunday Magazine, and, from there, things snowballed. “Prices went higher and higher with each succeeding election,” the Cosmopolitan report noted, “until twenty-five dollars [per vote] was the average.” (In 2012 dollars, that amount would equate to approximately $640.) Campaign managers oversaw gigantic slush funds, and nearly all men of voting age in the county, regardless of upbringing or occupation, dipped into the bag at election time. And no one, it seems, attempted to keep up appearances of propriety—despite the fact that the state of Ohio passed a law in the late 1880s making it illegal to compensate citizens for their votes. (Current federal law, as well as those of every state, expressly bans the practice of buying and selling votes.) Blair recalled in McClure’s the time when precinct leaders auctioned off a voter, “like a horse or a hog,” in front of a crowd at the courthouse in West Union (the county’s seat of government) that included the town’s mayor, the county sheriff, and the prosecuting attorney. An attempt to stop the buying and selling of votes in the 1890s via mutually agreed upon assurances from both parties worked wonders … for one election. Thereafter, candidates and residents went right back to their boodling ways. “These people down here, many of them,” Blair told the Times in 1911, “do not realize they are doing wrong when they sell their votes. It is a custom. They won’t go to the polls unless they are paid.” (Indeed, even Blair admitted to engaging in the practice during his younger days.) 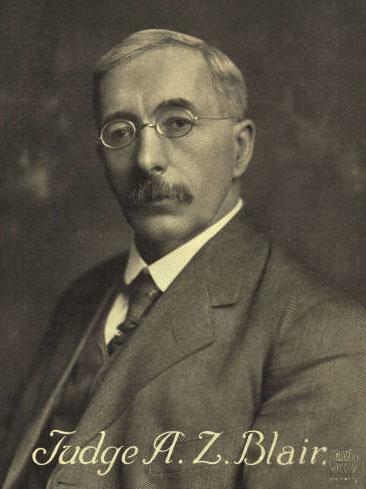 Around the time of the 1910 elections in Adams County, Blair, who was then serving as a common pleas judge for Adams and four neighboring counties, helped spearhead an investigation uncovering that 85 percent of voters in an average precinct had, at one time or another, bought or sold votes. By that point, he’d seen enough. The judge hatched an ingenious plan to put an end to local boodling in December 1910. As expertly spelled out by Albert Shaw in a 1911 article published by the American Review of Reviews, Blair empaneled a bipartisan grand jury and proceeded to call 200 or so known vote buyers and party leaders to testify in exchange for immunity. He demanded rosters including the names of those who sold their votes and figures related to pricing in each instance. That was step one, and it undoubtedly netted some valuable information. But the brilliance of Blair’s plan was that no one knew exactly how much. was to be the announcement, through all the newspapers of the county, and through all other sources of publicity, that the names of those who had sold their votes were known to Judge Blair and to the grand jury, and that indictments had been found against them. If, however, they were wise enough to come to West Union, the county seat, of their own free will and make confession to the judge,—thus saving the expense and trouble of serving papers and making arrests,—they would be treated with great leniency. The plan couldn’t have been more successful. “[B]y shrouding the workings of the probe in absolute mystery,” the Cosmopolitan story noted, “Judge Blair cunningly added to the panic.” One man confessed that, despite voting only once in the most recent election, he had accepted payment from different individuals by promising to vote three different ways on election day. Most individuals who voluntarily confessed received a $25 fine and a six-month prison sentence that was precluded from taking effect assuming good behavior. The fine, too, was lessened, with the average boodler paying approximately $5, plus court fees. The judge also barred all guilty parties from voting for a five-year period. The result, as reported by Blair in McClure’s: 1,679 convictions, which served to effectively disfranchise 26 percent of voters in Adams County for five years.